Americans’ concerns about prescription drug abuse have risen over the past four years, with some of largest increases coming among well-educated adults. 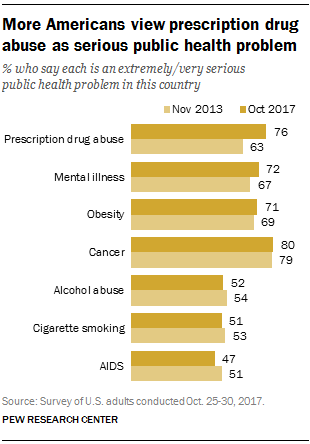 Today, 76% of the public says that prescription drug abuse is an extremely or very serious public health problem in America, compared with 63% who said the same in 2013. Just 22% regard prescription drug abuse as a somewhat serious or less serious problem, down from 34% in 2013. Concerns about mental illness are also up slightly from 2013. Currently, 72% say mental illness is an extremely or very serious public health problem, compared with 67% who said this four years ago, according to a Pew Research Center survey conducted Oct. 25-30 among 1,504 adults. Other public health concerns are largely unchanged since 2013. Eight-in-ten Americans now say cancer is an extremely or very serious problem, while 71% say the same for obesity; similar shares said this in 2013. The shares today saying that alcohol abuse (52%), smoking (51%) and AIDS (47%) are at least very serious public health concerns are little changed from four years ago and remain lower than other problems asked about. College graduates, in particular, express greater concern over prescription drug abuse than they did four years ago. And the educational differences in views of this problem have narrowed considerably. In 2013, 54% of those with a college degree or more said prescription drug abuse was a very or extremely serious problem. Today that number has increased to 80%. Among those with some college experience but no degree, 75% cite prescription drug abuse as at least a very serious problem, up from 60% in 2013. By contrast, concern about prescription drug abuse has remained largely stable among those with a high school diploma or less (70% said extremely/very serious in 2013; 75% say it today). Nearly eight-in-ten whites (79%) say prescription drug abuse as an extremely or very serious public health problem, a 17-percentage-point increase from 2013. Among nonwhites, 73% view prescription drug abuse as a major problem, little changed from four years ago (65%). As in the past, there are no significant partisan differences in views of whether prescription drug abuse is a serious public health problem. Large majorities in both parties say prescription drug abuse is an extremely or very serious problem. Both parties have seen similar increases in concern over prescription drug abuse: Among Republicans and Republican-leaning independents, the share saying it was extremely or very serious grew 16 percentage points, while among Democrats and Democratic leaners it increased 15 points. A separate Pew Research Center survey conducted in August found no partisan differences when it comes to having a family member or close friend who is addicted to drugs. In the new survey, about half of Americans (51%) say cigarette smoking is an extremely or very serious public health problem in the country today, but there are educational and racial differences in these views. People with less education are more likely to smoke, according to the Centers for Disease Control and Prevention. They are also more likely to say smoking is an extremely or very serious public health problem, the Pew Research Center survey found. Today 61% of those who have a high school education or less say smoking is at least a very serious problem, while only 44% those who have some college experience and 43% of those with a college degree or more say the same. 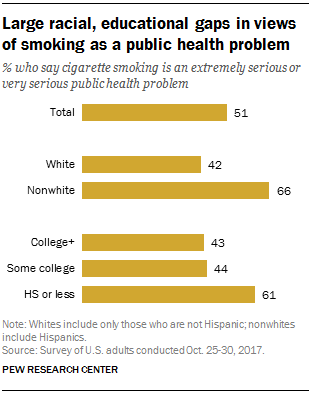 Two-thirds of nonwhites say smoking is an extremely or very serious public health problem, while 42% of whites say the same. While Republicans and Democrats generally agree about the severity of many public health problems, they diverge in their views of mental illness and AIDS as serious health problems for the country. Many Democrats and Democratic-leaning independents (78%) say mental illness is an extremely or very serious public health problem, compared with 63% of Republicans and Republican leaners. 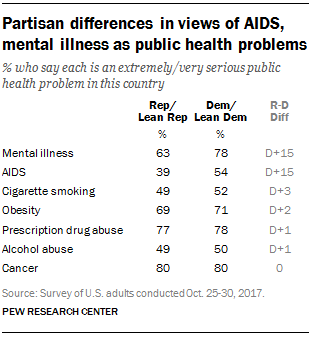 The partisan gap is about as large in views of AIDS, with 54% of Democrats and 39% of Republicans viewing it as at least a very serious public health concern. 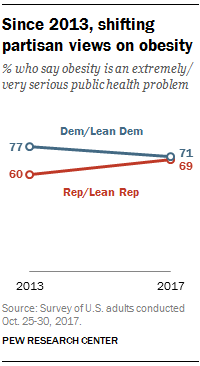 Yet there are virtually no partisan differences today in concerns over obesity: 71% of Democrats and 69% of Republicans say it is an extremely or very serious public health problem. Four years ago, 77% of Democrats said it was at least very serious problem, compared with 60% of Republicans.